Captain Jason Brewer entered the U.S. Army in 2008 and had his first assignment with Headquarters and Headquarters Detachment U.S. Army Alaska XO/S1 at Fort Richardson, Alaska. In 2016, CPT Brewer became the Missile Defense Operations Chief at the 100th Missile Defense Brigade in Colorado Springs, Colorado. In 2017, as the Brigade Missile Defense Operations Officer in Charge (MD-Ops OIC), CPT Brewer is incredibly vital to the team and involved in nearly every aspect of the Ground-Based Mid-Course Defense (GMD) enterprise. CPT Brewer was directly responsible for the 100th MDB’s planning and execution of the GMD Fire Control 7.A software upgrade development and testing conjunction with the Missile Defense Agency and NORTHCOM. Additionally, he led a team to test NORTHCOM’s updated tactics, techniques and procedures (TTPs) and provided changes for improvement. CPT Brewer then trained all GMD crews on the new TTPs to ensure a successful transition. 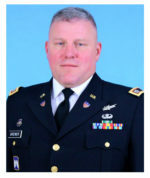 CPT Brewer also served as the lead BMD evaluator for the Brigade, which he conducted over 30 evaluations on both MDE and FDC crews and through his methodical evaluation technique and feedback, ensured the readiness of all GMD crews across the nation. During perhaps the highest OPTEMPO year in the 100th BDE’s history, CPT Brewer played a critical role in training and enabling crews to meet the 24-7 readiness requirements in defense of the homeland and led the unit’s successful test initiatives to ensure our nation continues to have the most effective and modern missile defense system in the world. CPT Brewer’s personal decorations include the Army Commendation Medal (2OLC), Army Achievement Medal (2OLC), National Defense Service Medal, and the Global War on Terrorism Service Medal.